The two families from two neighboring countries brought out long lists of traditions, almost doubling the civilities, and so the complications. It all started with casual phone conversations. Nazreen would ring her friend Nida. Every time, Nida’s cousin Sharjeel would receive the call. The phone would eventually reach Nida, but not before Sharjeel flirted (decorously though) with Nazreen for a while. Over time, the casual flirting morphed into serious discussions. Many dates and discussions later, the couple decided to marry. Planning for an equally amazing day to solemnize the beautiful seven-year long relationship took another seven long months. Now began the first real-life test for the couple. With what appeared to be a simple task until now, they soon realized would be quite the project. The two families from two neighboring countries brought out long lists of traditions, almost doubling the civilities, and so the complications. When the two began looking for a venue, they realized that seven months was not too early to begin. Since most couples book their venues a year ahead, they were late. Moreover, venues that were available could not accommodate Indian caters or were not big enough to hold the estimated number of guests. As luck would have it, the couple came across the Inverness Hall of Innisbrook in Tampa. 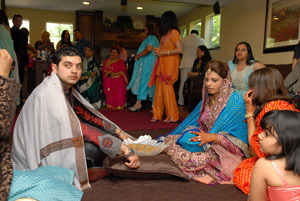 The venue could not only accommodate all guests, but also offered Indian catering. What was the icing on the cake? A pastry chef who accepted the challenge of carving the couple’s dream cake, the Taj Mahal. 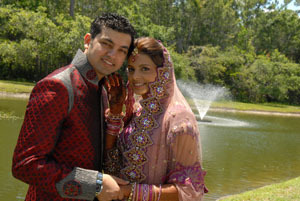 Since Nazreen’s family lives in Tampa, it was an ideal location. For Sharjeel, having a destination wedding was a dream come true. His family flew in from many different locales, and he rented a big place for a week where more than 150 relatives gathered to enjoy his special day. The festivities began with a ‘packing’ event, which was followed by the mehndi and the pithi. Special attraction of the ceremony was the dance floor. On the four corners of the floor, Rimal – the decorator placed umbrella like embellishments with traditional linen flowing around. That day, all guys wore black shalwar kameez. The event set a perfect tempo for the big day celebration. Wedding civilities were performed at Jamat Khana, the Ismaili prayer place. Adding to the grandeur was the Rolls Royce Limo which the couple rented for the ceremony and reception. 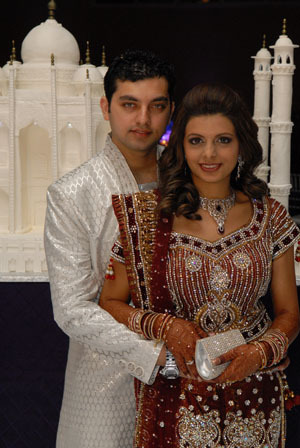 Nazreen went to India to shop for all of her wedding outfits, including her reception lehnga which Sharjeel wanted to buy for her. She knew that she would find her extraordinary outfits for the occasion only in India. And she did. From a boutique in Mumbai, she found a mermaid style maroon lehnga with Swarovski crystals thickly embedded all over. She wore a veil on her head during the nikah and had the dupatta on her shoulder for the reception. For the nikah, she had her hair in an up-do and wore a tika with subtle make-up. For the reception, she underwent a total transformation. She removed the tika, changed her hair, and went with bold make-up. Complementing her angelic Indian beauty was an exquisite svorovski crystal clutch, which was a gift from Sharjeel’s sister from Pakistan. It goes without saying that Nazreen looked like an angel on earth. Nazreen always wanted a Taj Mahal themed wedding, and her favorite color purple provided the shade for each of the ceremonies. The couple was sure they wanted a cake in the design of the Taj Mahal. Despite asking every baker in town, the two were unable to find anyone willing to take on the daunting task. Finally, the couple’s steadfast view of the symbol of love convinced the chef at Innisbrook to accept the dare. At the reception, a five-foot, intricately carved, amazing white Taj Mahal cake stood in the middle of the dance floor. Made of three different flavors, and adorned with lights, it was a magical sight. The theme colors were white and purple. Purple LED lights lighted the entire room, and the vases were pin spotted. The colors changed throughout the night. The chairs were silver chivalri and linens were eggplant purple. The tables, which were squares and rectangles, were decorated with crystals and candles. Decorator Remmal from Shangri-la came to the rescue when deciding the backdrop of the stage. A giant 10-foot Taj Mahal ice sculpture set in between two crystal columns adorned the stage. Placed in the reception hall were four different kinds of centerpieces. Two were tall vases that lit up in different colors to coordinate with the colors on the backdrop of the stage. The entire hall was surrounded by LED lights, which changed colors throughout the night. While enjoying the festivities, Sharjeel’s mind drifted towards the future – dreams of a beautiful and memorable honeymoon in Hawaii and many happy years to follow!